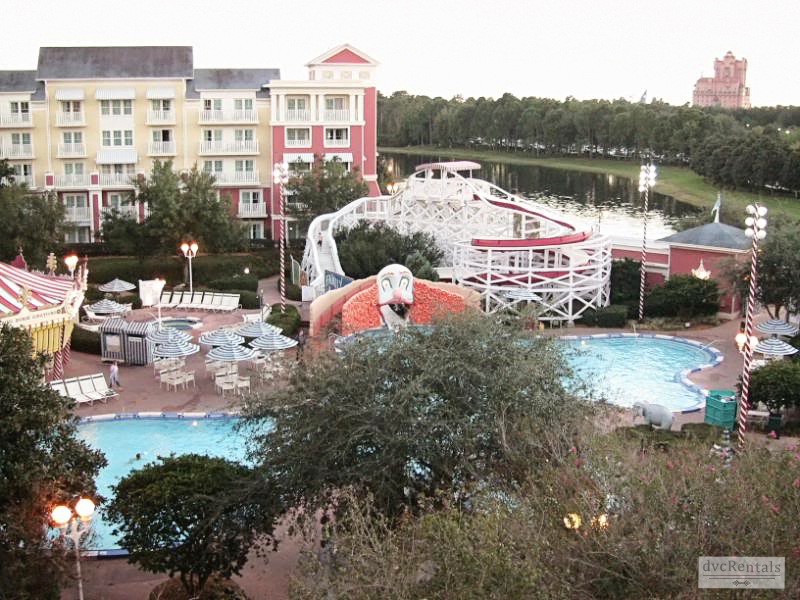 It’s morning at Boardwalk Villas. I checked in the previous evening and I’m ready to start my day. I scoot over to the curtains, open them and smile as I take in the view. Throwing on my robe, I step out onto the balcony. There are few people out this early as the Boardwalk is just “waking up”. I peer over the balcony, checking out the area from Atlantic Dance Hall on my left, around to the ESPN club to my right. In between the two are restaurants and shops. Across the way I can see the Yacht and Beach Club resorts. A “Friendship” ferry boat glides up Crescent Lake and pulls up to the dock. A few early risers get on board to head for Hollywood Studios. 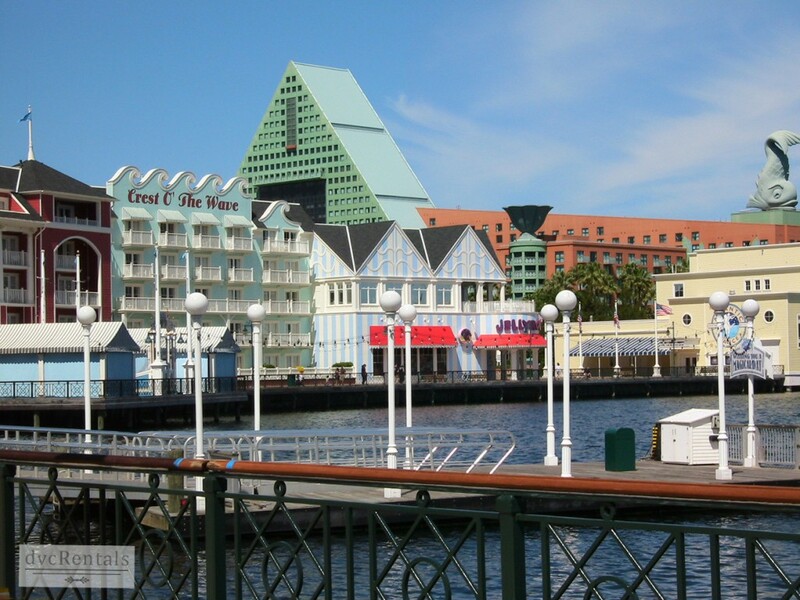 There are two docks at Boardwalk – one will get you a boat to the Studios while the other goes to Epcot. 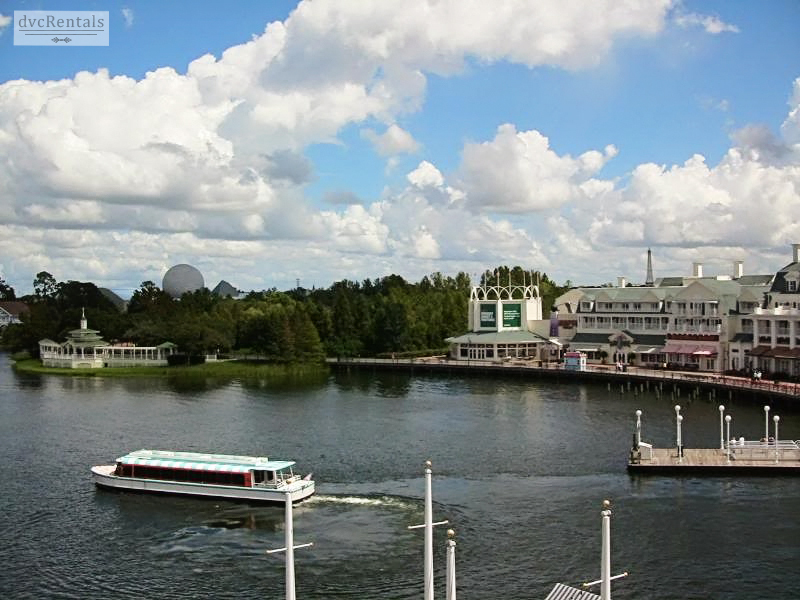 The Epcot boat is direct from the dock to the park, but the boat to Hollywood Studios makes stops at other resorts on the way and can take quite a while. I find it relaxing to watch them come and go from my balcony. I walk back inside over to the kitchen area. While I enjoy cooking in the villa for other meals, I like to get going early with something fast for breakfast. So after I had checked in the night before, I stopped at the Boardwalk Bakery, which is just a few steps from the front of the resort. I’d bought a blueberry muffin, which I now placed in the microwave to warm up, and then poured myself a glass of orange juice. I took both out to the balcony and set them down on the table, sat and enjoyed the feeling of the warm sun while surveying the scene on the boardwalk and eating the yummy muffin. Ok, time to get dressed and hit the park. Epcot, here I come! I walk down the hallway to the exit door on my floor that I know will exit the building closest to where I want to be on the Boardwalk. I’ve been to Boardwalk over 40 times, so I’ve got it down pretty well now. But I remember the adventure when I was a newbie, of trying to figure out which exit is best for the boardwalk area and which is best for the bus stop, MGM Studios (now Hollywood Studios), community hall, etc. I turn right once I am out on the boardwalk and start walking towards Epcot. There are a number of stores and vendors on the way. I pass a pin cart, face painter, caricature artist and DVC sales cart on my left along the railing by the water. On the right, I see Flying Fish Café (an upscale seafood restaurant), Seashore Sweets (super ice cream and fudge as well as other confections), Trattoria al Forno (Italian Cuisine) and the bakery I mentioned earlier. As I continue, I pass a self service booth on my left where you can pose and make custom post cards. On my right is the ESPN club. It’s quiet there now, but in the early evenings, especially on nights with big sporting events, the line for a table snakes out the door onto the boardwalk. Continuing down there’s a gazebo on my left that juts out into Crescent Lake. I’ve passed here often and witnessed weddings taking place on numerous occasions. 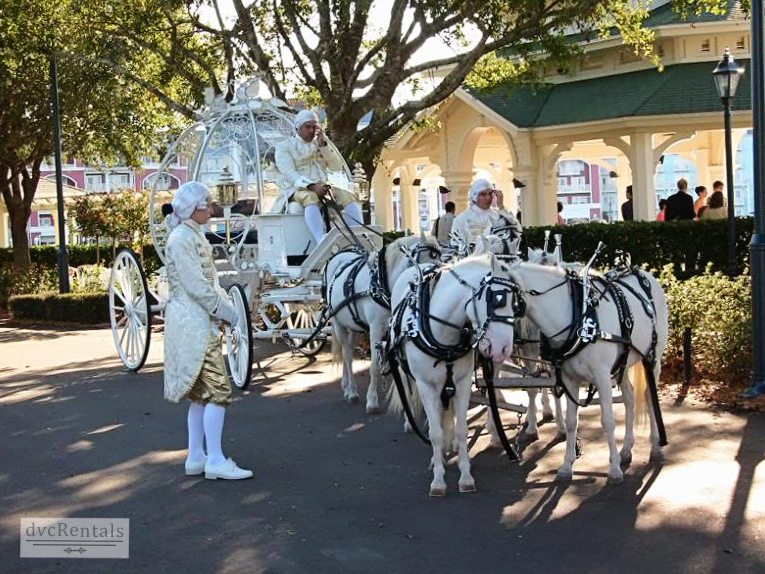 During one visit I was lucky enough to witness the pumpkin carriage, beautifully transformed into Cinderella’s Crystal Coach, complete with footmen, waiting to take the new bride and groom away after their wedding ceremony. I walk up over the bridge that will lead me to Epcot, glancing left at the Beach Club Villas and then turning right to continue the journey to the theme park. In about 100 feet I join others who have lined up to wait for the cast members to let us into the park. There are only a few folks ahead of me. This entrance, called the International Gateway is sometimes referred to as Epcot’s “Back Door”. 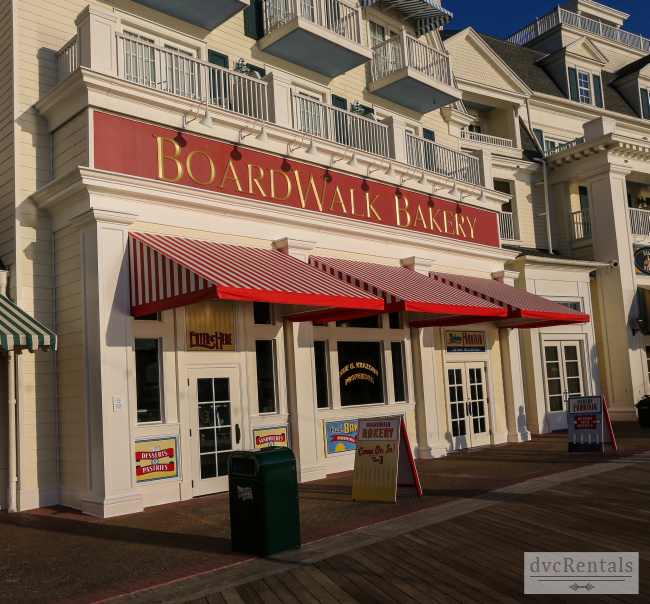 For the most part, guests that enter in this way are people who are staying at one of the Boardwalk area resort hotels, or guests who have eaten a meal at one of those resorts. The large majority of folks visiting Epcot come in where the monorail, buses and cars have access—the front of the park by Spaceship Earth. There are numerous folks who don’t even know that International Gateway exists. At about 8:50 am they let us go through the turnstiles, but we have to wait at the end of a wide sloped path for them to drop the rope before we can actually enter the park. At 9:00 am we’re in! International Gateway leads into the United Kingdom area of World Showcase. I turn left and head towards Future World. World Showcase attractions are not yet open and will not be open until 11:00 am. However, Les Halles Bakery in France is open for breakfast, a rather recent addition. There was a time World Showcase was completely closed until 11:00 am. I see a few guests who entered with me and a cast member or two scurrying by now and then. United Kingdom and Canada look like ghost towns, especially compared to how packed they will look just a few hours from now. I enjoy the relative solitude as I amble over to Future World. I used my FastPass+ to ride Soarin’, Nemo and Journey Into Imagination with Figment, then did the single rider line at Test Track. A visit to Epcot is not complete without a walkthrough of my favorite store—Mouse Gear. It is one of the largest stores on Walt Disney World property. They sell everything from Magic Bands to Monorail sets and everything in between. It’s also a blessed relief from the heat to stroll around the air conditioned store. Break time, back to the Boardwalk! Again, I opt to walk. I have found that the boat docks for quite some time and waits for guests. 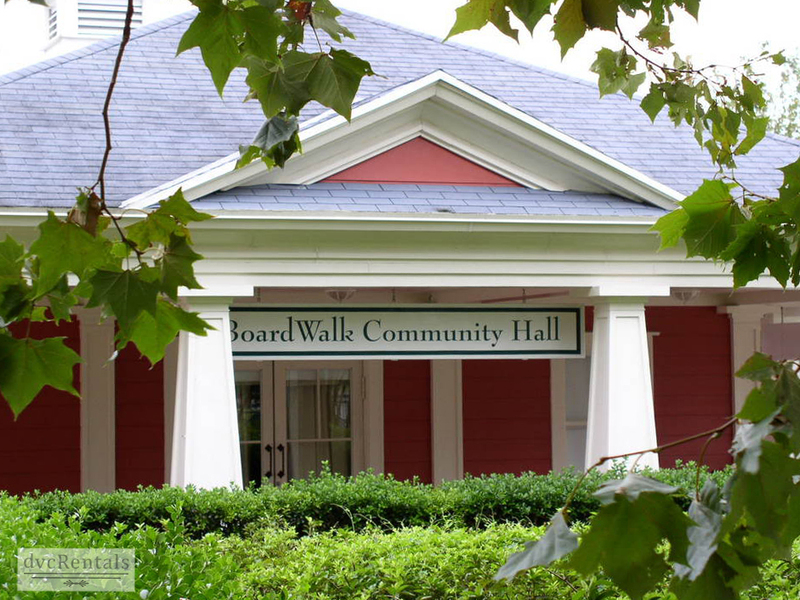 It takes some time to get going to Boardwalk Villas. Unless it’s just about to shove off I always get back faster by walking. I am not very patient and I love to walk. However, the boat is a great option for families with little ones or those with walking problems, or for anyone who is just too darn hot and tired to walk another step! 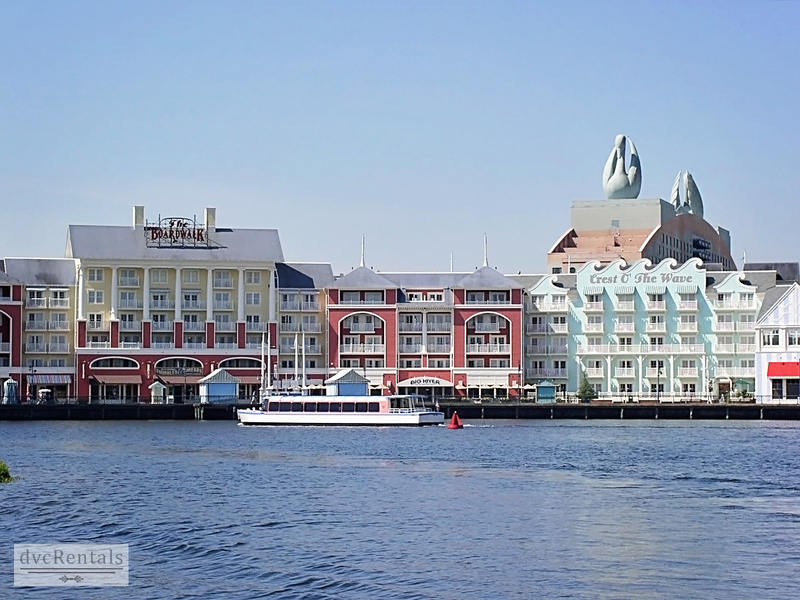 Looking across Crescent Lake, I can see the Swan and Dolphin resorts on the way back to Boardwalk. It’s hard not to notice the huge icons on top of those resorts. I enjoy going over to the Fantasia Gardens and Fairways Miniature Golf course near the Swan and Dolphin resorts. It’s a very cute course and is open very late, usually until 11:00 pm. I reach Boardwalk and smile as I always do when I see the gorgeous flowers in the planters out front. As I am hot from the walk I enter the resort through the first door on the left past the Flying Fish Café. That’s the first chance to hit some A/C. Boardwalk Villas shares the building with Disney’s Boardwalk Inn, a deluxe resort. This entrance is on the inn side, so I walk up the steps towards the main lobby where I can cross over to the villas. Straight ahead is check in and the main lobby. To my left and behind me is the Bellevue Lounge. Besides having adult beverages, the Bellevue is handy in the morning if you have forgotten to go to the Boardwalk Bakery the night before. While the lounge has less selection than the bakery, there is a decent choice of muffins and pastries in this convenient location. The Boardwalk Resort & Villas is themed on old seaside amusement park areas, mostly Atlantic City, NJ and Coney Island in NY. I walk towards the central lobby, passing paintings of early 1900 amusement parks on the left. There are some of those old time penny movie machines on the right, the ones where you have to turn the reel to watch an animated movie. As I enter the lobby I get that feeling of awe that I always do. There’s a huge ceiling that must be at least three stories high. There’s a miniature horse carousel – look for the hidden Mickey on the rump of the pinto; over the fireplace is a replica of an Lucy the Elephant, a six story elephant shaped building that actually existed at one time at South Atlantic City, NJ (now called Margate); gorgeous horse paintings over the registration area, and it’s furnished with perfectly mismatched overstuffed chairs and couches. 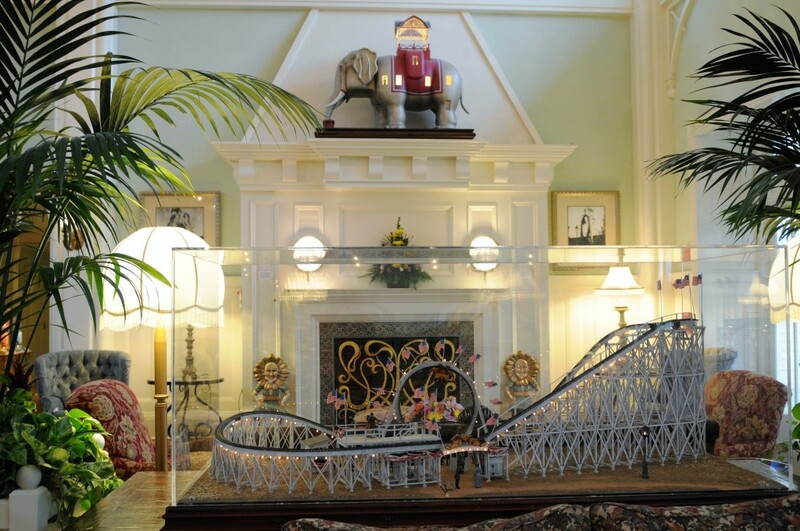 For more details on the Boardwalk lobby check out our blog “Turn-of-the-Century Art at Disney’s Boardwalk Resort and Villas“. I walk towards the elevator, passing the only shop inside the resort. This relatively small store is where you can buy Disney Vacation Club (DVC) merchandise, as well as some Boardwalk Villa items and limited other souvenirs. This is also where you can find stamps, aspirin, needles and thread, toothbrushes—little necessities that you might have forgotten. Done with lunch/break, I decide to walk to Disney’s Hollywood Studios. I wind my way down the corridor until I reach the exit I know will get me closest to Hollywood Studios. I exit the resort and walk along the canal, following the path all the way to the Studios. I usually see water fowl there and today is no exception. There are numerous ducks and as a bonus I see an Egret, and a Heron! I love this walk – hardly anyone else seems to ever be there but me and the friendship boats that go by. Within 15 minutes I arrive at Hollywood Studios. At about 6PM I head back to Boardwalk, having walked back from the Studios. On the way back I stop off at the Community Hall, as that is right on the way just off the path along the canal. There is a ping pong table here, as well as foosball and a couple of video games. All free for DVC members. They also do some activities with younger kids, some at no cost and some for a small fee. You can rent bikes here as well. In front of the resort you can get surrey bikes that are for families to ride together, but Community Hall has regular one person bikes. I walk a little closer to the resort and decide to enter by the elevators, which are just inside near the pool area. The main Boardwalk pool area is called Luna Park, named after a part of Brooklyn’s Coney Island Amusement park area. There is a really cool, nice sized pool slide that looks like a roller coaster on the outside, and the exit of the slide is the mouth of a huge clown. If you have a clown phobia this may be a little scary for you, but I enjoy it enormously. There’s also a kiddie area with elephants that sprinkle water and a children’s pool. For the grown-ups, Leaping Horse Libations pool bar serves drinks and snacks up until dark most nights. After a visit to the room and some dinner, I go down to the boardwalk again. 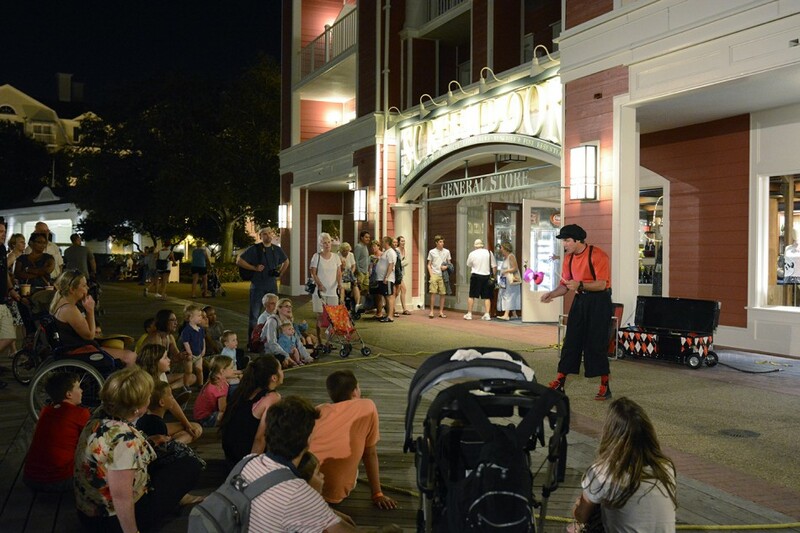 It’s time to watch the free entertainment on the boardwalk. It runs from about 7-10:00 pm. There are magicians, jugglers, acrobats and more. Most have very clever acts and make you laugh while they amaze you with their tricks and talent. There are usually 3 or 4 different acts per night, and each puts his or her show on four or five times per night. They often pull participants out of the audience, so be careful to stay back if you don’t like being in the spotlight. There are also midway games out on the boardwalk where you can win prizes. These games have a fee, as does the small arcade that is located near the pool area. Done watching the entertainers, I walk down the boardwalk past the stores that sell everything from milk and bread to bathing suits and everything in between. Most nights the stores are open until 11:00 pm. I keep walking to the end of the boardwalk. 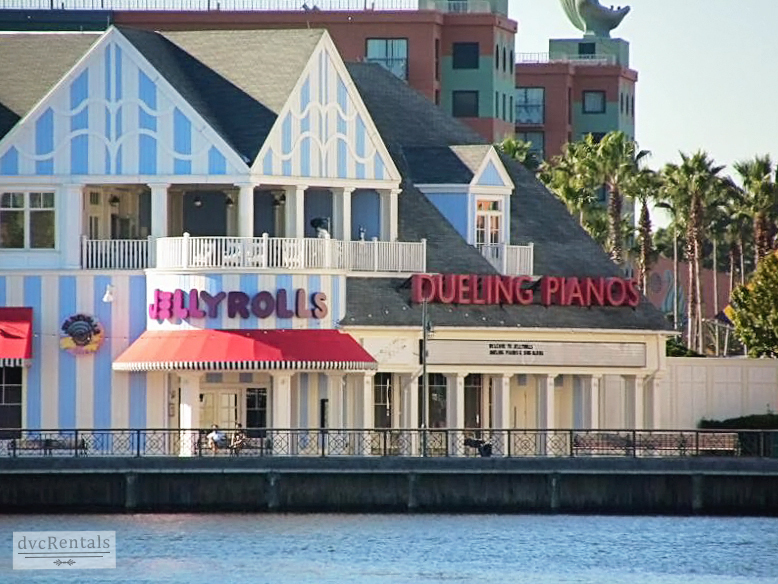 I am headed to one of my favorite night spots at Walt Disney World – Jellyrolls, the “Dueling Pianos” bar! What a fun place! I meet up with some friends and we all go in together. There are two pianos, with 4 piano players that rotate on and off all evening. The musicians take requests and as they play songs the audience sings along. Every so often the people working there make the whole audience stand up and join in with the wait staff doing a dance (they instruct you as you do it). It’s a lot of fun with a very good vibe sort of place. (21 and over only here). I’m not a dancer, but next door to Jellyrolls is the Atlantic Dance Hall I mentioned earlier. While Jellyrolls is open every night, usually until 2:00 am, Atlantic Dance Hall is closed some evenings, so be sure to check the schedule if you want to go there. It’s been a long day, time for a Jacuzzi, shower and bedtime in the villa. The following day I have a massage appointment in the Boardwalk health club, Muscles & Bustles. I’ve been there before and they always do a great job—and it’s 15% off for DVC members. I fall asleep tired but very happy, it’s always a wonderful experience staying at Boardwalk Villas! 21 thoughts on "My Day at Disney’s Boardwalk Villas"
I know there is a pull out in the living room. Can anyone let me know if the 2 bedroom villas have rooms with queen size beds and how many people can stay there. All 2 bedrooms are lockoffs, King in the master, queen and double sofa bed in the 2nd bedroom (studio), queen sofa bed in the living room. Debbie Brant Can six adults fit nicely in a 2 bedroom villa. Can’t wait until our December stay here!! Hoping to stay here in the spring! I will never stay there again I prefer to be across the water at the Yacht Club looking over at the boardwalk as my view . I love all that the boardwalk has to offer but not the resort itself we had a room on the side listening to loud young adults all night long . Horrible experience. The resort did comp us back money , but it just ruined it for us. The Yacht Club has always been so quiet & peaceful. I wish I could say it was a good experience. The staff I can say was great . Absolutely love the ambiance there and hope to stay there soon. You were lucky to have gotten a boardwalk view room. Those are hard to book. Was just there in May. Love the board walk and how close it is to everything. The lights at night are beautiful. The general store has everything you could want for your room. My favourite and home resort.